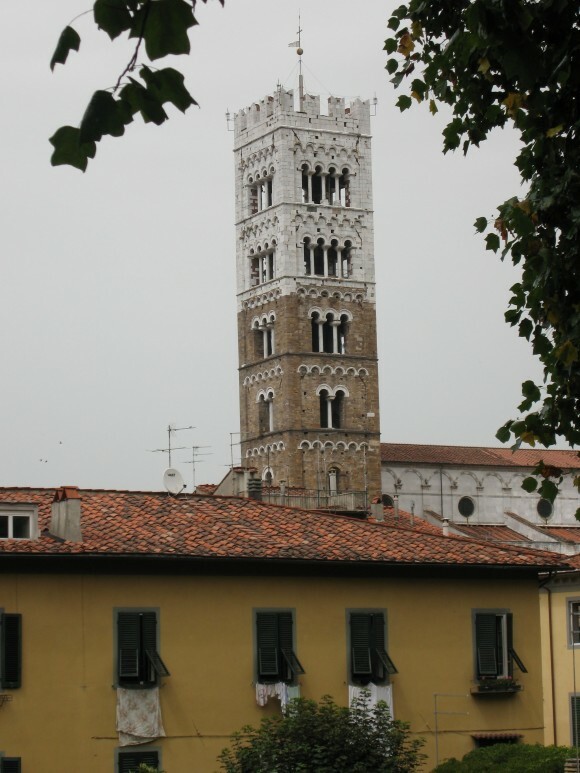 We left Lerici and decided to stop in Lucca on the way to Castellina. 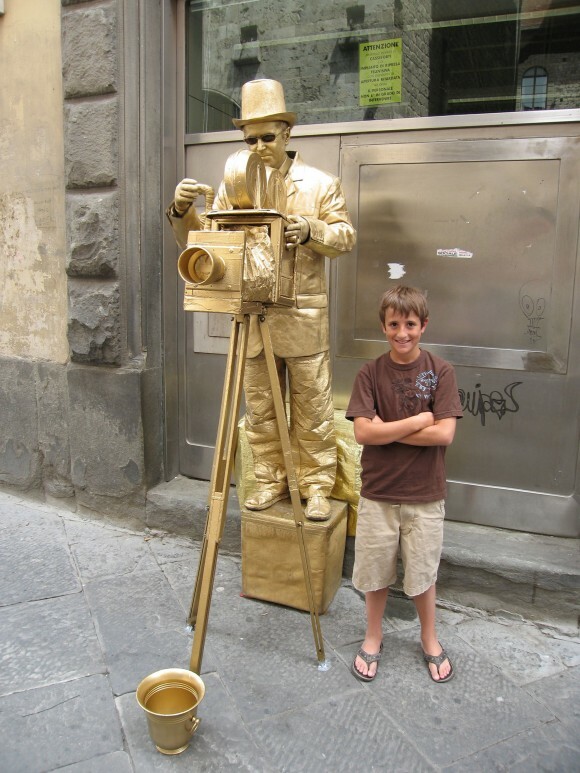 I know everybody raves about Lucca, but frankly we do not know what all the excitement is about. We had a nice visit and a nice lunch but I guess we were not really enamored by it. Oh well, to each his own. 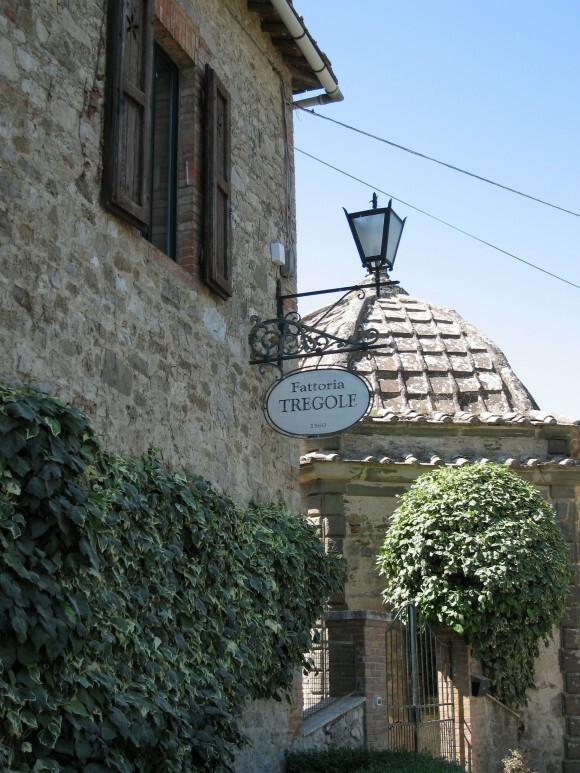 We left Lucca to drive on to Fattoria Tregole in Castellina in Chianti. 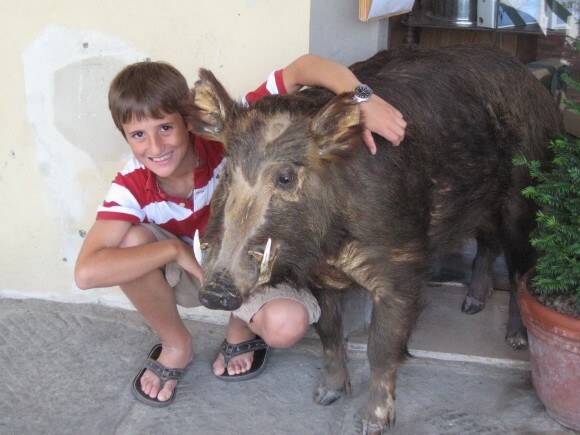 There was very little information on this wonderful Fattoria on the internet. 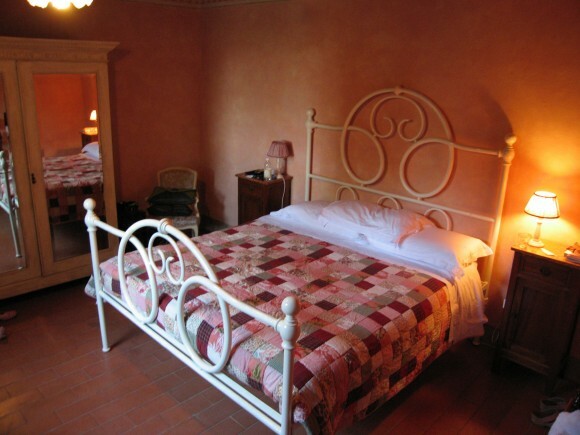 No postings on Trip Advisor (when we returned I wrote only the second review on TA – now there are over eighty reviews and it is #1 in Castellina in Chianti) and very little mention on Fodors. However it came highly recommended by Megan and she was right!! 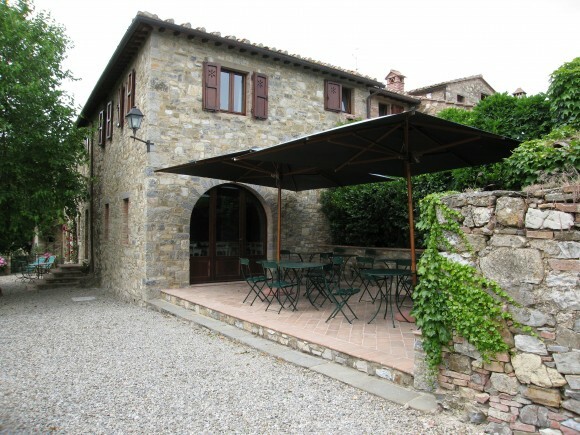 It was a wonderful place located just 4km outside of Castellina in Chianti in Tregole. 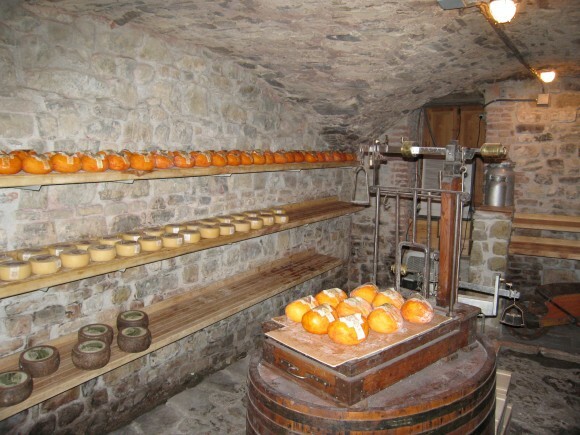 All the buildings are stone, the original wine cellar was built in 1000, and the remainder of the house was built in 1580. It has a nice large pool, and a patio where breakfast is served. 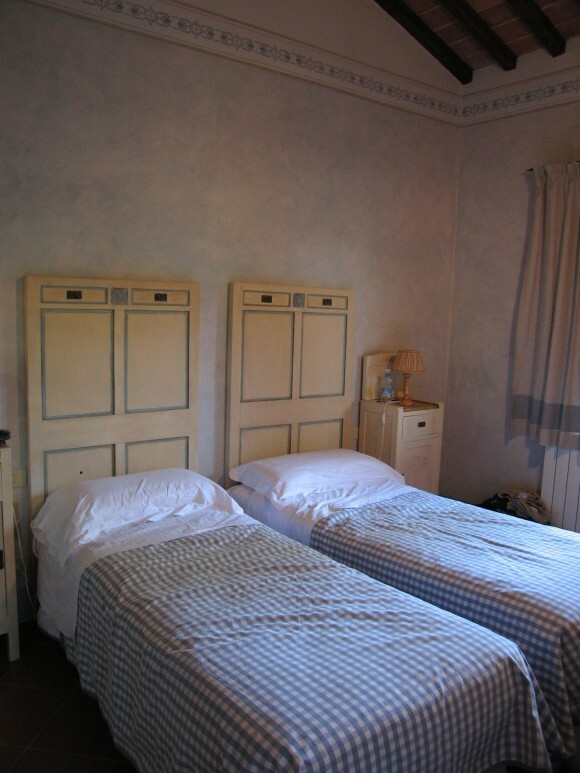 It had five rooms and two apartments. 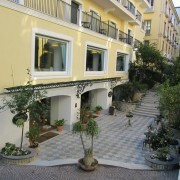 We rented the Aia apartment and it was wonderful. 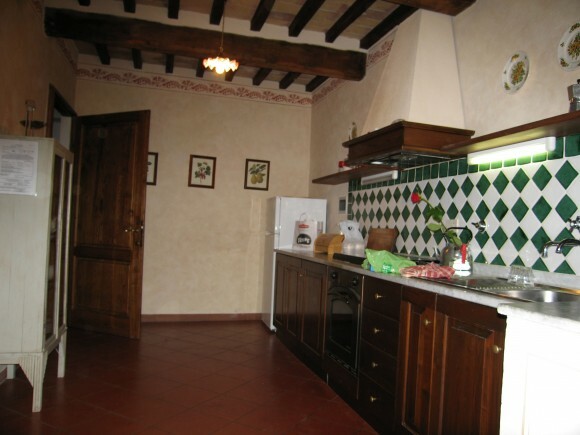 A very large apartment with two bedrooms, two bathrooms, a kitchen, and a living room with a dining room table. 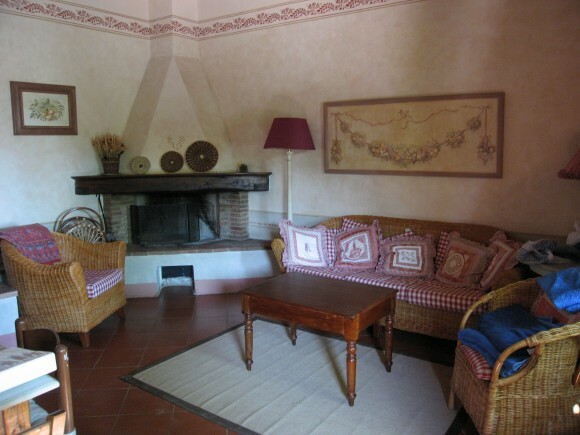 There was also a private courtyard just outside one of the bedrooms. We never used the kitchen for cooking but it was nice to have the big refrigerator for drinks, cheese and meats. Edith and her husband run the B&B along with two women who seemed to do everything from cooking and cleaning to doing your laundry. Edith was extremely helpful with information on where to go and what to see. She also usually made dinner once or twice a week for the guests if you would like. We had two of her dinners and they were both great, and we really enjoyed meeting some of the other guests as well. 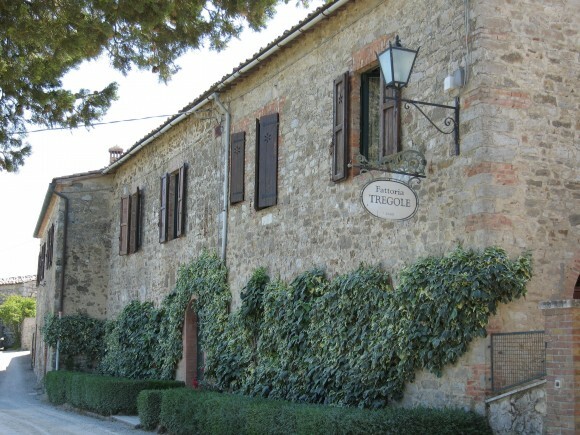 When we arrived at Fattoria Tregole we were beat from the drive, so rested. Lucky for us, this was one of the evenings Edith made dinner, so we were able to rest and just walk a few steps to dinner. Our first course was three different antipasti, all very good, particularly the pastry with funghi. 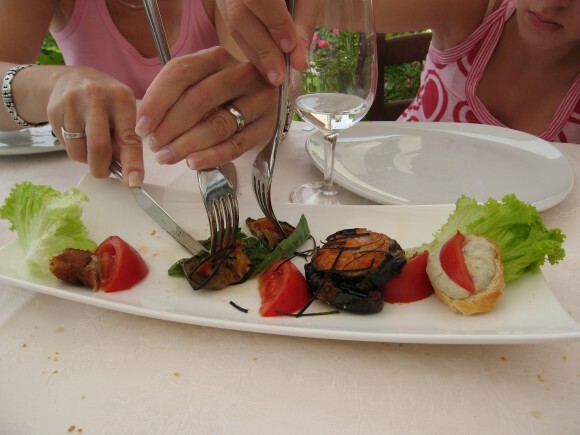 We then had an excellent pasta with zucchini flowers, pork for our entrée, and tiramisu for dessert. It was a bit windy that evening so she served inside rather than on the patio. We enjoyed our dinner and had a nice evening visiting with some of the other guests. The next morning we had a nice breakfast on the patio. The weather was overcast, although still warm. Breakfast included, cheese, meats, fruit, cereals and yogurt. We were not really sure what our plan was for the day but decided to start in Greve. 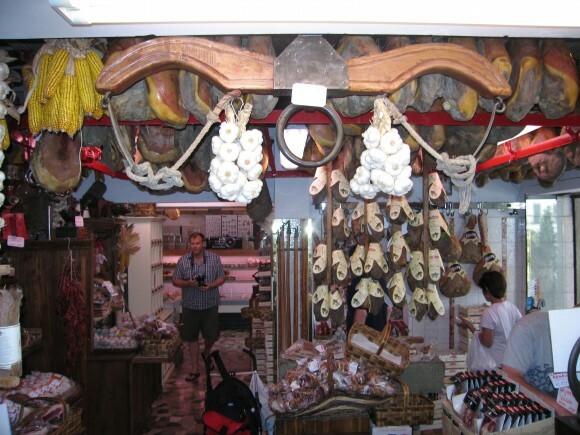 This is a nice town with a great piazza and a lot of interesting stores, particularly the butcher shop with a lot of meat “hanging around”. 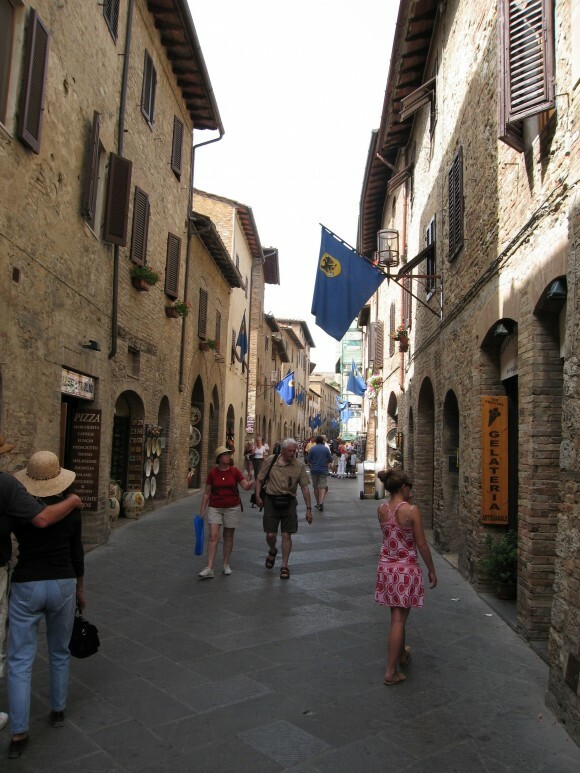 Our only complaint is that the town is mostly tourists and the shops are geared that way as well. But we enjoyed our time there. Next we drove to Lamole. 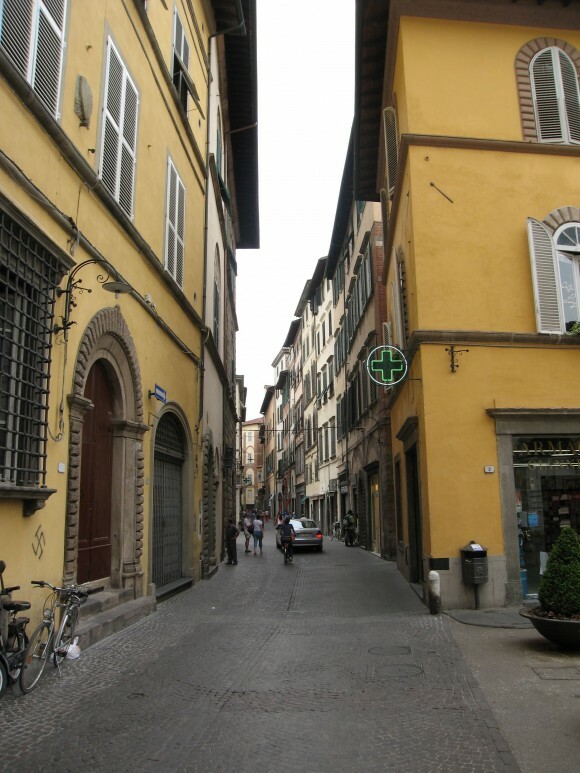 Edith recommended that we drive there and have lunch at Ristorante Lamole. The turn off the main highway between Castellina and Greve is just a few kilometers south of Greve. 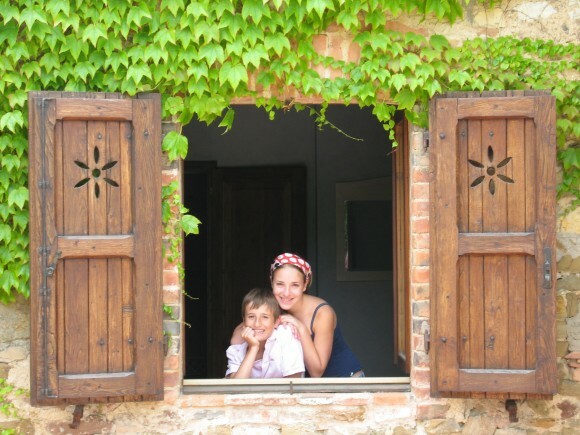 It is about a 10 –15 minute drive, but we thought it was the most beautiful drive we had in Tuscany. 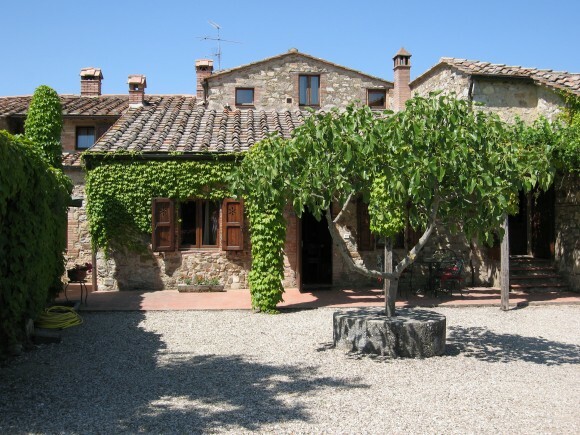 Beautiful vineyards with old stone homes. The restaurant has spectacular views, the wait staff was friendly and appeared to speak fluent Italian, German and English. We enjoyed our lunch, my sausage with cannelloni beans was particularly good. 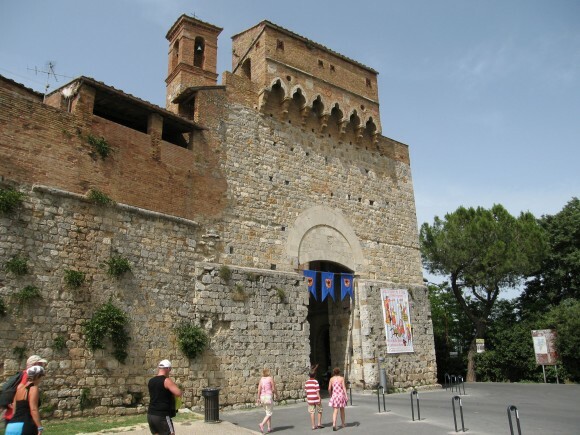 Despite the distance and the need to do a bit of backtracking we decided to go to San Gimignano. We arrived about 4:00 so were hoping maybe the throngs were gone. 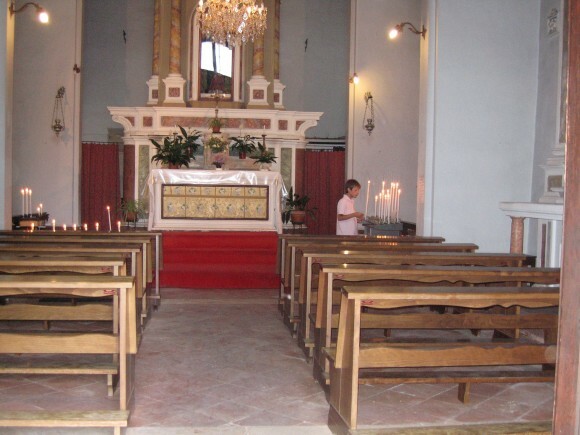 Unfortunately, it was still filled with people. It is a beautiful town with stunning architecture. The towers and the buildings are fabulous. However, it just seemed a bit Disneyesque. I would definitely love to return in a less busy time of year. We did stop and have some gelato at the Gelateria di Piazza in the Piazza della cisterna. They are the 2006 World Champions of gelato. It was very good. I promised Michael we would go through the Torture Museum (Museo Della Pena di Morte – Via S. Giovanni, 15/A). It was perfect for a ten year old boy, and we actually all found it quite interesting. It is amazing what those people came up with in the Middle Ages. That night we had dinner at Il Tinello (Via IV Novembre, 102 in Castellina). This place got mixed reviews from the four of us. 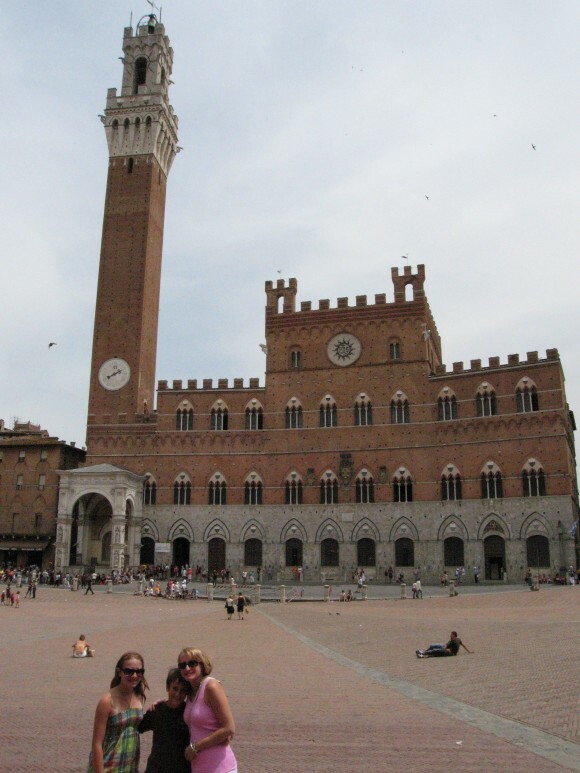 Today was our 20th anniversary and we decided to spend the day in Siena. 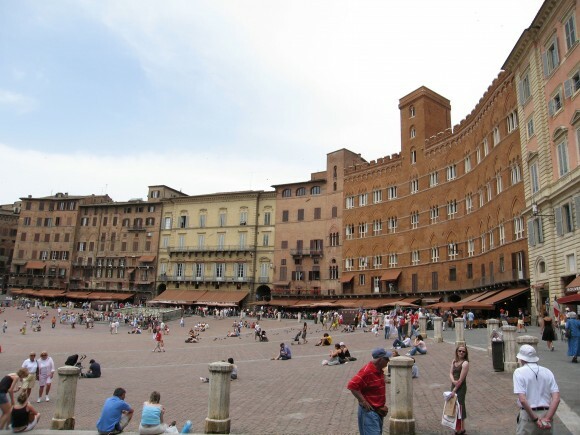 We had been there on our last trip, taking a bus from Florence, and were looking forward to our return visit. We had a great time exploring the city and did some shopping. For lunch we ate at La Torre where we had eaten on our last visit. 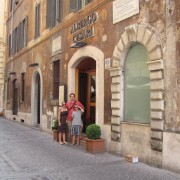 It is a wonderful little restaurant where the owner just lists off the menu in Italian. Once again we had incredible ravioli and gnocchi and the best osso bucco ever. 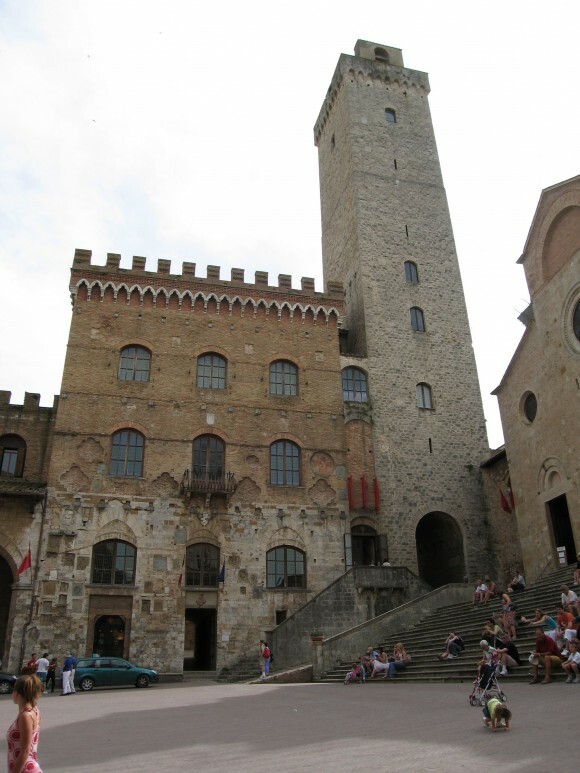 If you are standing in the piazza looking at the tower, just to the left of the tower is an arch, walk through the arch and it is on the left hand side. 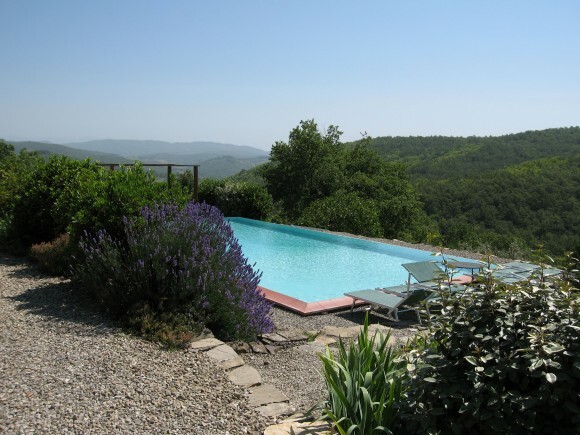 We drove back to Fattoria Tregole and rested by the pool. 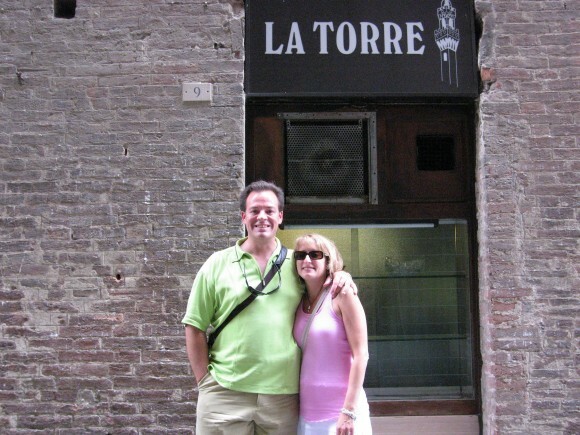 We had tried to get a reservation at Galapappa a Michelin one-star restaurant for dinner to celebrate our anniversary, but could not get in until the next night, so our second choice was Osteria Le Logge in Siena ( Via del Porrione, 33). On our way to the restaurant Lauren actually discovered a vintage clothing store still open after 8:00pm and found a stylish “Jackie O” style dress. 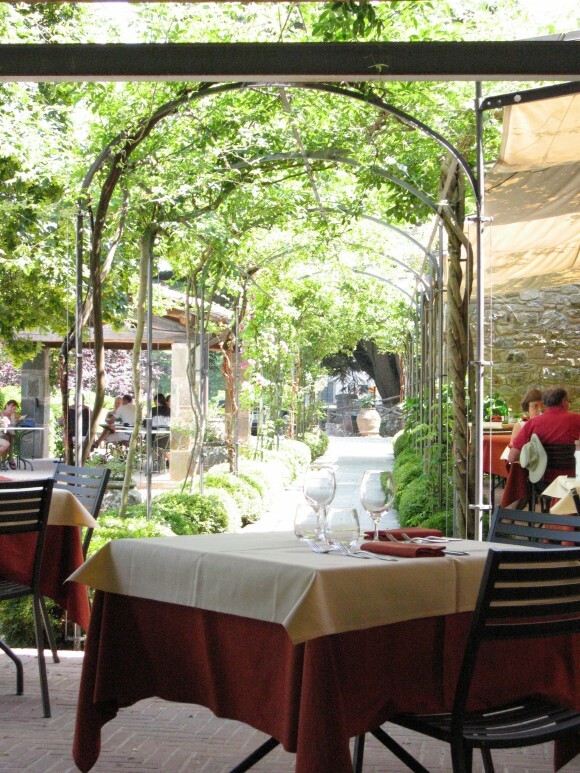 We had a wonderful outdoor table at Le Logge and ordered Bistecca Florentine. The waiter brought out the raw piece of meat for us to okay. We had a wonderful dinner celebrating our 20th anniversary. 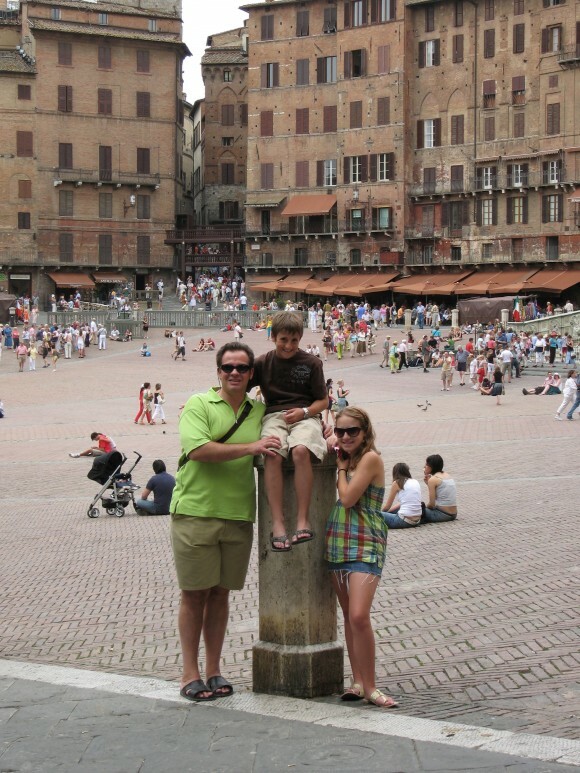 As we headed back to our car it was about 11:30pm and the campo in Siena was packed. A lot of young people were out for the night. 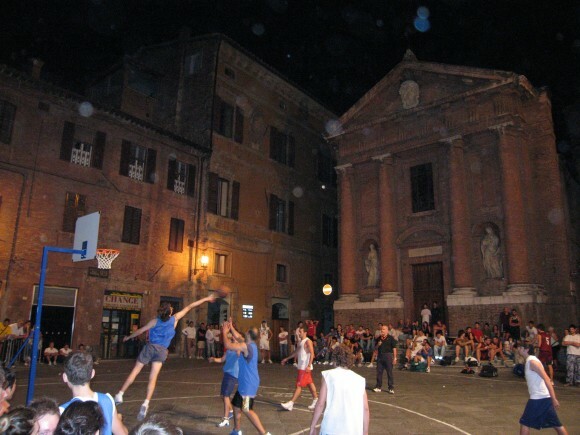 We passed a smaller piazza where they were having a “street ball” (basketball) tournament. Michael really enjoyed watching them. The next morning we were really not sure what our plan for the day was. The weather was still overcast and we even had a bit of rain during breakfast. 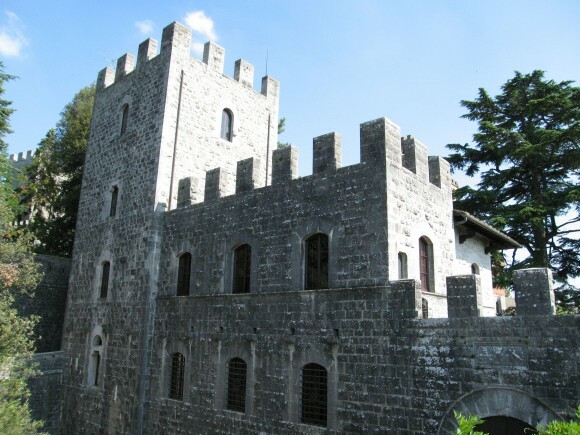 First, we decided to drive to Panzano, just south of Greve. It is a cute town, but there was really not much there, and unless you were planning on eating dinner there, I would skip it. So, next we decided to drive over to Pienza. 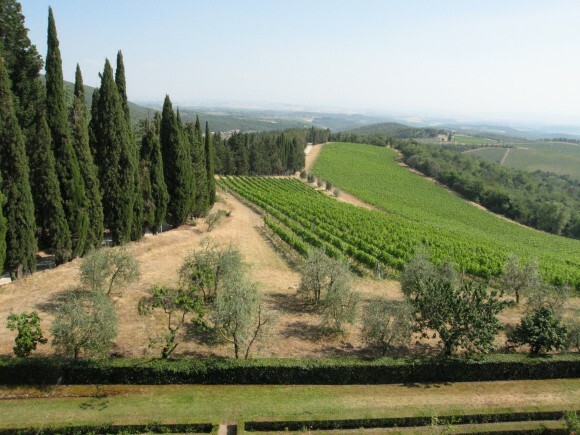 One of the guests staying at our hotel who had been to Montalcino, Montepulciano and Pienza said Pienza was his favorite. 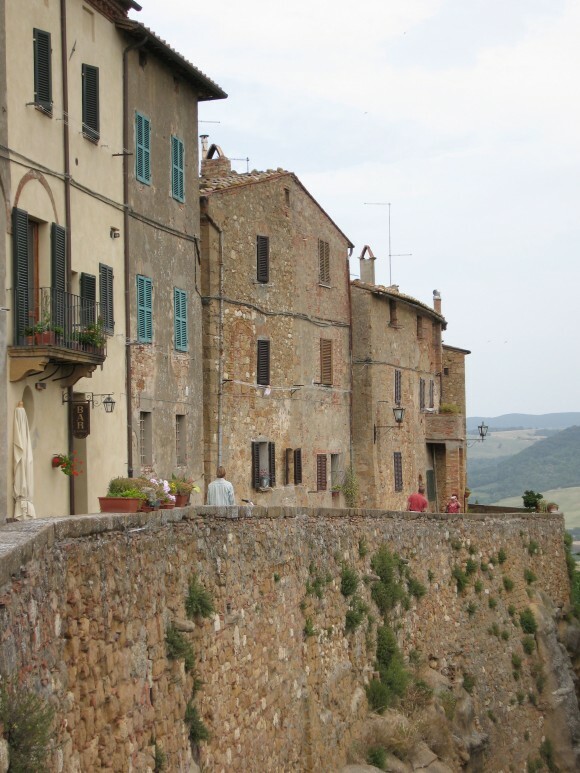 It was a bit of a drive (over an hour from Castellina) but it turned out to be our favorite town in Tuscany. This part of Tuscany was not quite as green as the Chianti region, but had the beautiful yellow fields and tall cypress trees. It was a beautiful drive. Pienza is a delightful town, very well laid out (apparently a Pope designed it) with beautiful buildings, most having lovely flower baskets hanging from their windows. 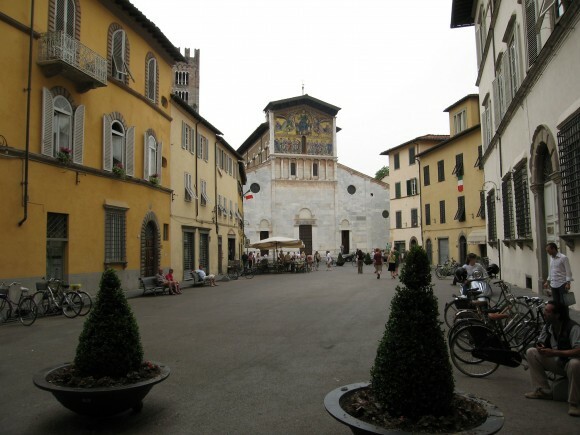 A nice piazza with the church and a TON of cheese shops!! 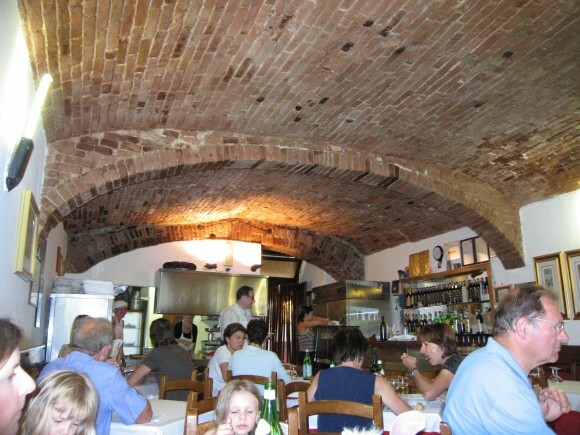 It was late and we had not eaten lunch so we stopped at Enoteca Baccus La Vineria (Corso Rossellino, 70). We had a nice lunch and our new food find was aged pecorino dipped in chestnut honey – scrumptious! We immediately headed to a small shop to buy some jars of chestnut honey. Then we walked around, visited the church, definitely one of the brightest churches we have been in, and enjoyed the spectacular view from the ramparts. 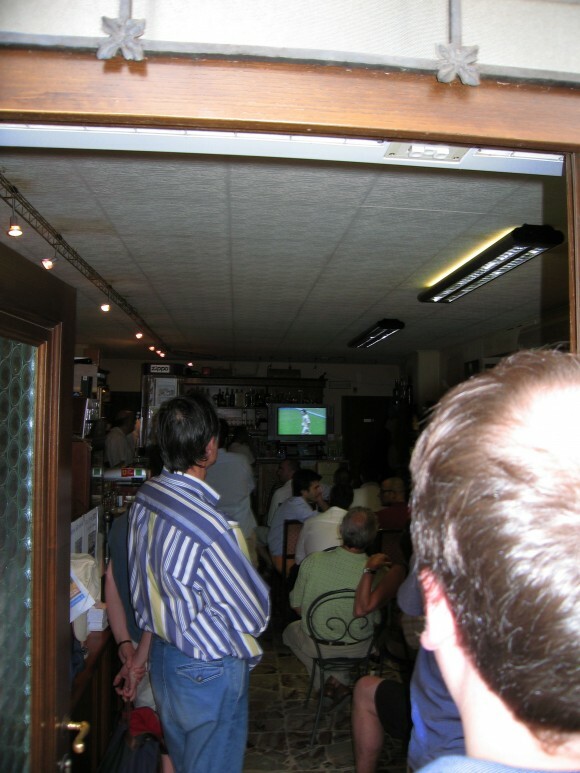 Stephen walked into a bar to get an espresso, turned out it was the Italy-Czech World Cup match. All the tables were removed and the chairs were all lined up stadium style as the bar was filled to the brim with spectators. For the five minutes we were in the bar Italy scored and the crowd went wild!! Along the streets most shopkeepers were opened but sat outside on chairs listening to the game on the radio. For dinner we ate at Gallopapa in Castellina in Chianti. Apparently, it recently got its first Michelin star rating. We ordered the tasting menu and had an incredible dinner. A lot of very creative dishes that were excellent. The only thing we think did not quite work was the dessert. 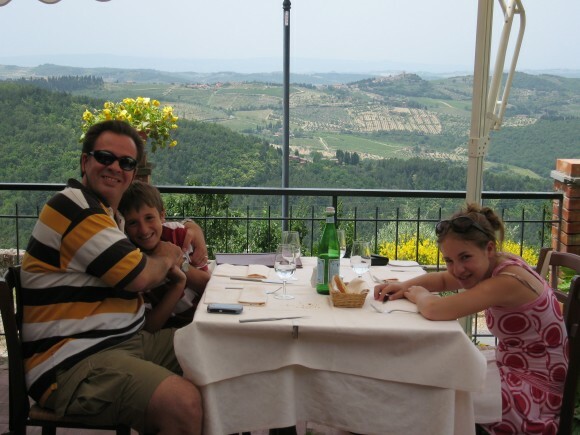 The next day we decided we were tired of driving super long distances, so Edith encouraged us to explore more of the local Chianti region. 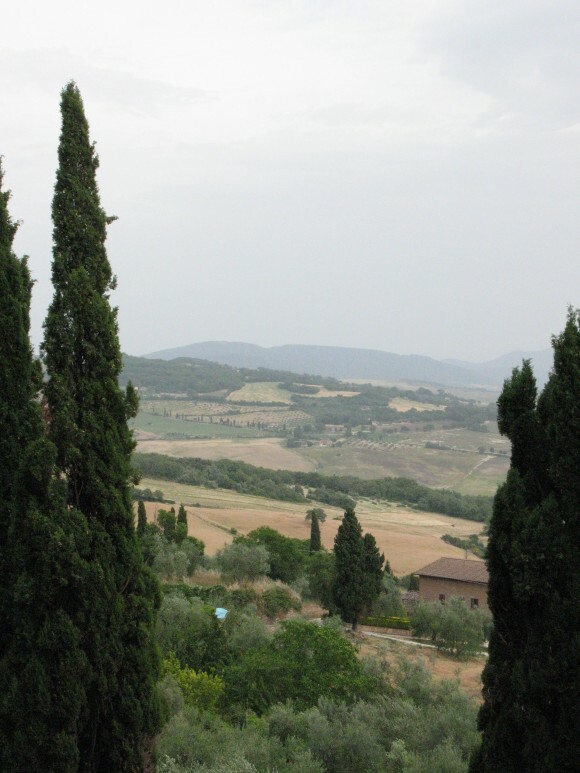 This was our first day truly “under the Tuscan sun” as the overcast weather was finally gone and we had clear blue skies. 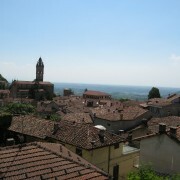 We drove to Radda in Chianti, yet another charming town. Lauren found a cute top in a local shop. There was a beautiful park there with a lot of shady trees and a great play structure for kids to climb on. 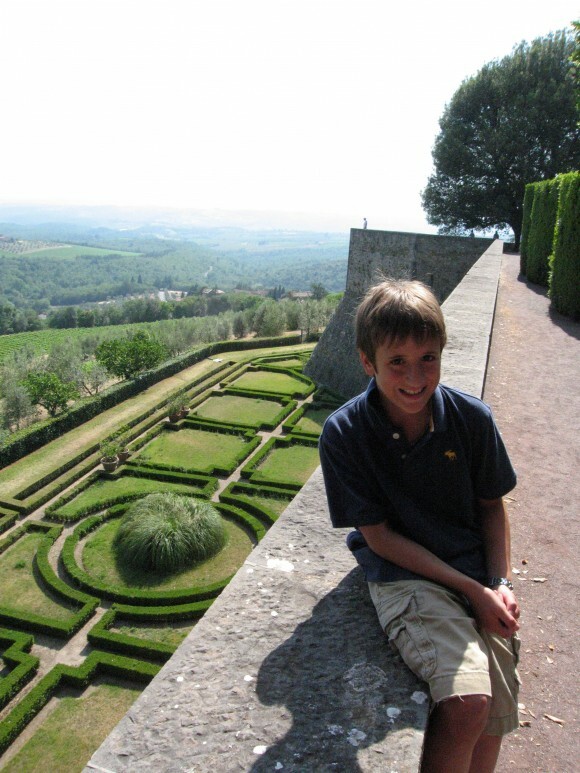 Next we drove up to Badia A Coltibuono, an abbey, outside of Gaiole in Chianti. This was a lunch recommendation from Megan and we had a fantastic meal out on the patio with another spectacular view. All the food was excellent but the venison Michael had was the highlight. 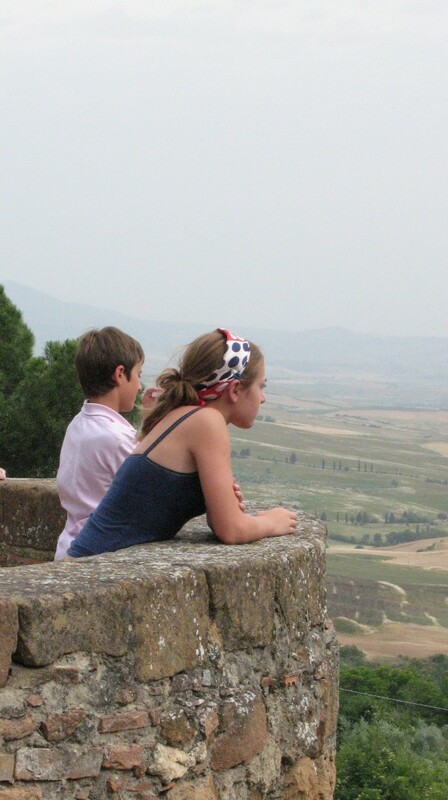 From here we drove to Castel d’Brolio. 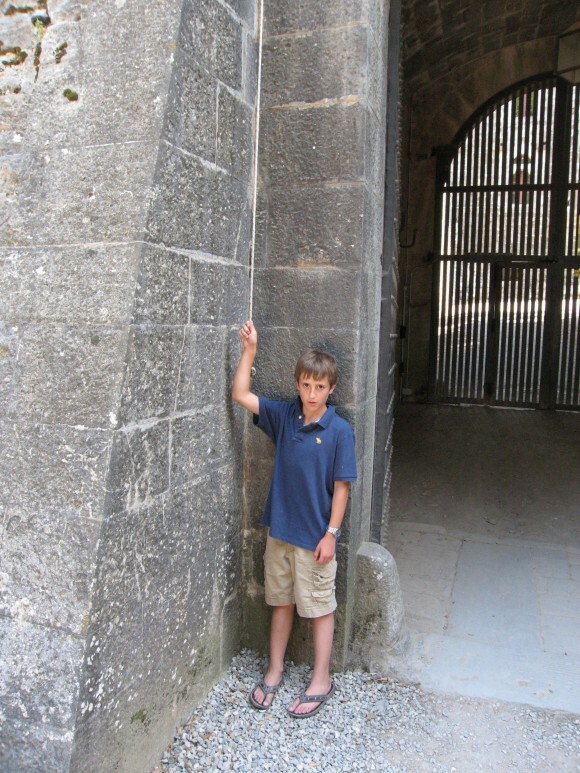 We walked up to the castle walls and rang the bell from outside the gates. 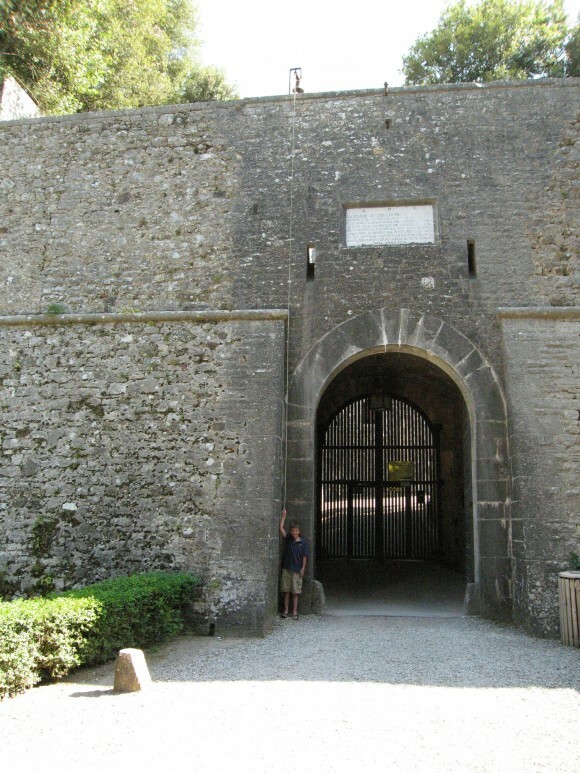 A caretaker came to open the gates and took our money (five euros per person). You cannot go in the castle as there are still people living there, but you can go in the chapel and crypt and walk around the castle and the gardens. The crypt was very interesting and the views around the property were spectacular. Our last night in Tuscany and Edith, once again, made dinner at our B&B. We ate out on the terrace and enjoyed a wonderful dinner and visit with our fellow guests from So. California, Florida and Germany.